This beautiful Oklahoma City resident was unhappy with the shape and color of her teeth. She wanted a younger, fresher, more uniform smile without the blemishes and black triangles at the gumline. Many of our new patients have recently had significant dentistry and sometimes they express disappointment in the outcome of this work. This patient had veneers placed on her upper teeth a few years ago which were chipped and leaking at the gumline, which showed black cavities at the margins of her veneers near the gumline. 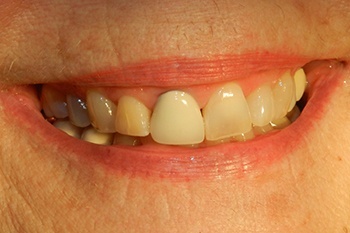 Recent development in porcelain technology has an answer for patients like this with mismatched color and shape of their teeth. 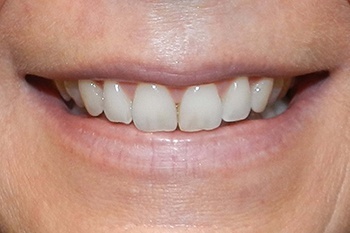 E Max porcelain veneers with very little tooth reduction were used to transform this patient's smile. E Max veneers can be as thin as 0.3 millimeters thick while still achieving uniform shade and shape. The result is a symmetrical smile with teeth that have more uniformity of color while at the same time a youthful, non-worn look. 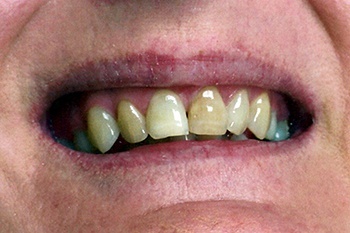 This Oklahoma City socialite wanted to close the gap between her 2 front teeth. For years she had contemplated closing the space but could never pull the trigger on treatment. Her lower teeth were also crowded, and she noticed this worsening over the last few years. She noticed her upper teeth when smiling and her lower teeth when she was talking. She didn't want traditional metal braces and wanted to preserve her natural teeth. This gorgeous patient was able to achieve her dental goals with Invisalign treatment and whitening. Invisalign trays (or aligners) are custom made to fit your teeth and are less than 1 millimeter thick. A series of trays are manufactured specifically for your teeth and bite which are worn for 1-2 weeks duration. Instead of the brackets and wires used in traditional dental braces, the aligner exerts a low load force necessary to permanently move your teeth. Unlike metal dental braces, there is not a painful tightening of wires. Progress is achieved by simply advancing from one tray to the next. Each aligner moves you closer to the finished product - your beautiful new smile. 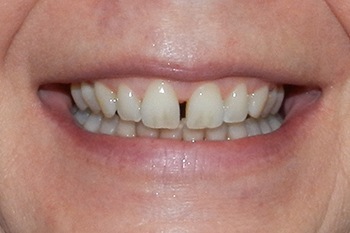 This northwest Oklahoma City resident complained that a crown in the front of her mouth did not match the color of the rest of her teeth and also a black line had formed at the gumline around the crown. She had noticed this crown in pictures of herself recently and started limiting her smile when taking pictures as not to show her teeth. She wanted to replace the crown with one that matched and did not display a black line at the gumline. She was worried about matching the shape and shade of the new crownto the rest of her teeth and wanted her smile to "look natural." This patient was able to achieve her treatment goals through 2 steps. First, she received in-office ZOOM whitening in order to whiten and brighten her smile overall. Next, she elected to have cosmetic crowns placed on her 2 upper front teeth to give her an overall beautiful, natural smile. The previous crown that was removed was made of metal underneath porcelain which was the black line that displayed at the gumline. Cosmetic crowns are made of porcelain which gives the color and translucency of natural teeth. She was so pleased with her outcome that she indicated that she wished she had done this "years ago." This future attorney was unhappy with the spacing and gaps of his smile. He never had braces as an adolescent and his teeth were worn and misshapen after years of malocclusion. 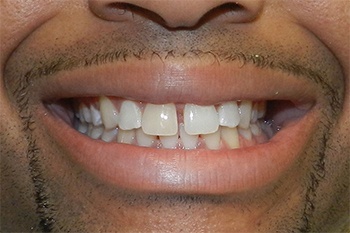 He wanted to close the gaps in his teeth and to improve the shape of his teeth to a more youthful-looking smile. 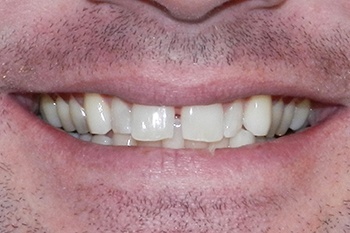 He didn't want to have traditional metal braces and wanted to avoid veneers if possible. This patient's smile makeover was completed with minimally invasive dentistry. 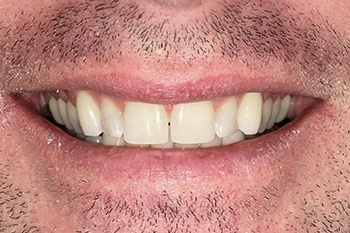 He received Invisalign treatment with clear aligner trays. 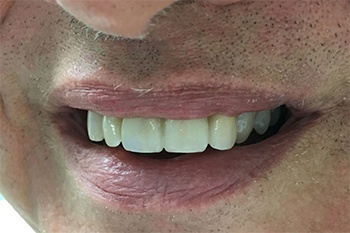 Although the trays are almost invisible, he liked the fact that he could take the Invisalign trays out if he had an important meeting or was going to be in photographs that he didn't want the trays to be displayed. 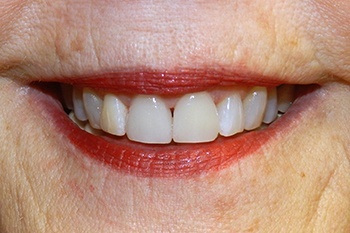 After completing Invisalign, enamaloplasty was completed to reshape his teeth after years of wear. This helped renew the shape and harmony of a youthful smile. All of our Invisalign patients receive complimentary whitening which also noticeably brightened and whitened his smile. 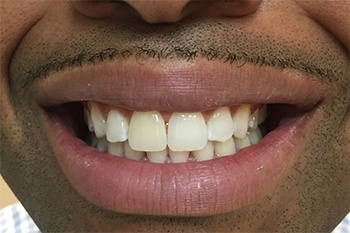 This former football player had braces in high school but did not wear his retainers to maintain the position of his teeth. 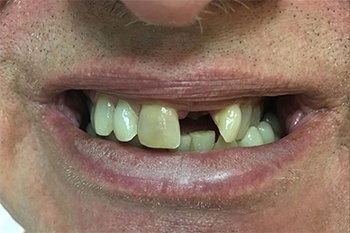 Over the years, his teeth have drifted and he developed gaps and drifting of several teeth. He was interested in Invisalign because he regularly gives presentations and wanted the option to take out the Invisalign trays as needed. 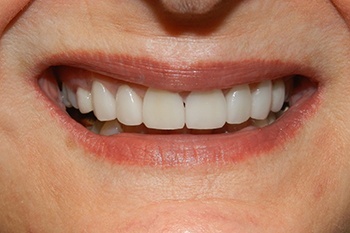 This fantastic smile was achieved with Invisalign accompanied with whitening. It is truly amazing that this took only 3 months of treatment. Dr. Mitchell prefers Invisalign clear aligners because they have over 20 years of research, over 900 patents, and have treated over 5 million smiles. When a tooth is lost, an excellent way to replace it is with a dental implant. A dental implant has the same basic shape as a normal front tooth and root. Dental implants require a minimum amount of space between the roots of the adjacent teeth in order to be placed. If there is not enough room, orthodontics is an option to move the roots and allow enough space for the dental implant. For those that don't want to go through orthodontics, another great option to replace a missing tooth is a dental bridge. This Oklahoma City pastor wanted to replace a missing tooth. We discussed replacing the tooth with a dental implant or a dental bridge. He decided that a dental bridge was the best choice for him. Because he was traveling on mission trips and time was extremely valuable to him, he wanted the quickest treatment option. The final dental bridge was fully completed and delivered in 3 weeks. A temporary bridge was utilized during the 3-week window while the final dental bridge was being constructed. The porcelain bridge gave this patient the natural smile he wanted- nobody but his dentist and hygienist will know he is missing a tooth. Zirconium was used to make this bridge strong.